Burns reflects on first year leading real estate company. Robert Burns recently celebrated his first anniversary with Coldwell Banker Mid-America Group, Realtors, taking the helm as president in September 2015. Any accomplishments that you are particularly proud of this past year? I’m extremely proud of the cultural shift we’ve been able to effect in the organization, both with our independent sales associates and staff. We’ve been able to foster a more robust culture of growth and innovation. People across the organization are now taking ownership of and bringing ideas to the table, and forming project teams to bring them to fruition. It has moved from a top down approach to a very grassroots movement, with a culture that’s a competition of good ideas and execution. It’s not my plan or my company—it’s our company and our plan. How did the company culture change? First, it started with me taking a collaborative/coaching approach, having planning or strategy sessions with everyone from independent contractor sales associates to my direct report employees. Having a weekly meeting with my direct reports could feel like micromanagement. But the conversation is really about what their goals are, and how I can help break down barriers and provide resources and support to help them achieve their goals. My primary responsibility is to communicate with everyone to ensure we are on the right track and making the right decisions. So I am constantly talking to sales associates in our branches and various small groups in the company to make sure we’re headed in the right direction. Second, there was a certain amount of the staff that simply weren’t “on the bus” and weren’t going to get on the bus. So we had to make some personnel changes. Some found an opportunity to, perhaps, plug into a different organization that was more in tune with their way of working. Are there other achievements you want to highlight? We successfully opened an office in the Historic East Village. We’re the only real estate office downtown. We opened up a new branch office in Pella, which is very exciting. Economically, Pella has a lot of advantages. The average sale price in Pella is about $40,000 more per home than Des Moines. There’s large corporations there, so there’s constant influx and outgoing relocations. The decision raised some eyebrows, but we had the research to back it up. I’ve tried to bring an organizational/analytical discipline to decision making here, which comes from previous experience working with very large corporations. What areas are you focusing on? We are coming off implementing a new transaction management system that will by mid- to late next year allow us to be completely paperless. In early November, we will be launching a new website/contact management system—basically, a revamped operating system for our brokerage. We’re also doing numerous, incremental upgrades to our internal intranet sites. And a couple months ago, we implemented a new relocation management software to manage our incoming and outgoing corporate relocation business. What are the hot real estate trends? 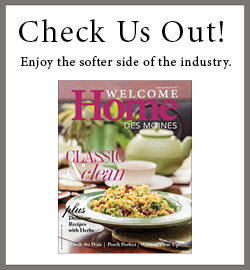 One constant, very important component in the Des Moines and central Iowa market is new construction and homebuilding. Earlier this year we created a new role, a homebuilder marketing manager position. We hired Sarah Kavalier for the job and put together a staff. Now we’re starting to capture more new construction projects and bring additional builders into our organization to work with our sales associates. Many are talking about downtown Des Moines development and millenials moving downtown. But we’re seeing the Baby Boomers significantly outnumber them, selling their homes and downsizing to condominiums or town houses. But rentals are quickly going to overtake owned units downtown, so that may change very quickly. Personally, my wife and I are members of a number of different groups affiliated with the Des Moines Art Center, as well as the Des Moines Metro Opera Guild. Professionally, our company has a long history supporting the American Cancer and Leukemia & Lymphoma societies. A new partnership for us that I’m very excited about is with Youth Emergency Services & Shelter (YESS). We worked with YESS to put on a field day in August for the kids at the shelter with a bounce house, face painting, haircuts, manicures, and more. It was a big deal to the kids that we chose to spend time with them because we wanted to. It was just a great day with the kids, giving them a chance to have some fun. I live in Clive with my wife, Crystal Burns, and sons Braden, 9, and Grayson, 6. I’m a native Minnesotan and my wife is from Eagle Grove, Iowa. It’s wonderful to be back in the Midwest. Des Moines is such a gem. It has all the amenities a city much larger would have—art, culture, cuisine, sports teams, entertainment. It’s easy, fun, and convenient to live here. The education system my kids are in is just amazing. We’re very grateful.